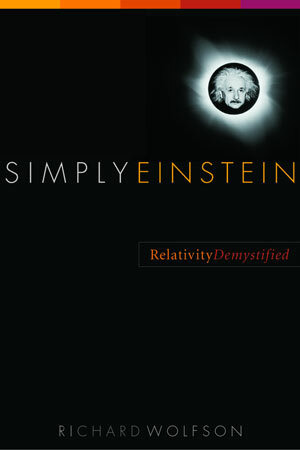 Simply Einstein - Description | W. W. Norton & Company Ltd.
With this reader-friendly book, it doesn't take an Einstein to understand the theory of relativity and its remarkable consequences. In clear, understandable terms, physicist Richard Wolfson explores the ideas at the heart of relativity and shows how they lead to such seeming absurdities as time travel, curved space, black holes, and new meaning for the idea of past and future. Drawing from years of teaching modern physics to nonscientists, Wolfson explains in a lively, conversational style the simple principles underlying Einstein's theory. Relativity, Wolfson shows, gave us a new view of space and time, opening the door to questions about their flexible nature: Is the universe finite or infinite? Will it expand forever or eventually collapse in a "big crunch"? Is time travel possible? What goes on inside a black hole? How does gravity really work? These questions at the forefront of twenty-first-century physics are all rooted in the profound and sweeping vision of Albert Einstein's early twentieth-century theory. Wolfson leads his readers on an intellectual journey that culminates in a universe made almost unimaginably rich by the principles that Einstein first discovered.